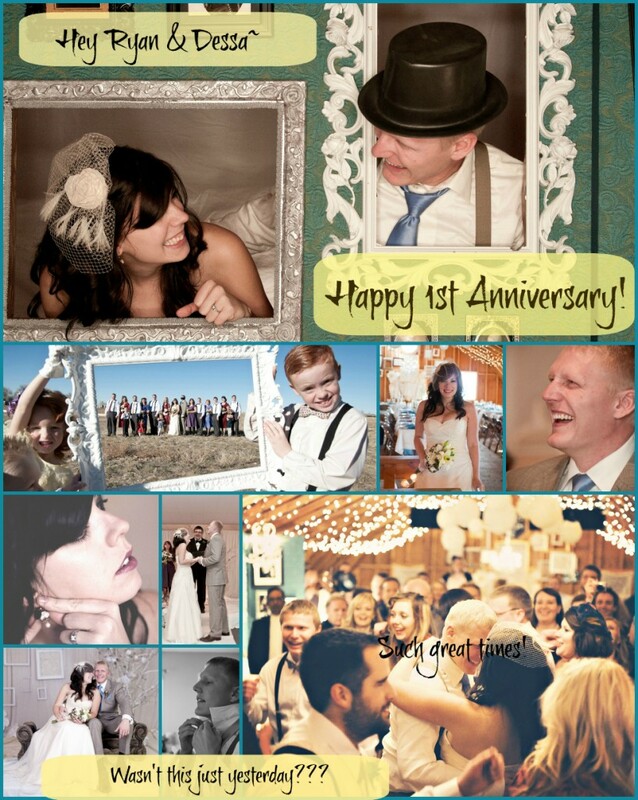 Happy 1st Anniversary, Ryan and Tredessa! A year ago today…a YEAR AGO today. Already? It seems just a couple of months back, but it has been a year. It has been a whole year since two families got together and laughed and loved and took a gazillion photogrpahs and hand-designed-and-crafted a million of the most intricate wedding details ever. Like your sisters before you, there was not a lot of time between the will-you???-YES!!! part and the actual walking down the aisle, but you had a vision and it was family and heirlooms and close friends and individuality, and sacred (those vows!) and silly (permanent marker all over that groom) and wow it was sweet. It is a day I treasure and I think the whole family feels the same. I would love to be in that barn again tonight under all the twinkle lights, dancing and rejoicing and reprising the family rendition of “Dance Me to the End of Love.” Haha. That darn “such great times” was supposed to have been deleted before I saved this image. Grrrr. But you can see what I meant. And they were great times!!! Happy anniversary to the couple I got to see fall in love SUPER first hand. Last year was so special in so many ways – not only because I finally bought a house, but because I got to spend so much time with you guys while Dessa was living with me prior to the “I do’s” and get to know Ryan so well. I am blessed to know you and call you family – love you guys SO stinkin much and cherish every time I get to hang with you at your house – and Saber loves it too:) Joy, children, peace, intimacy, sparks, patience and LOVE to you for countless years to come! Thank you, Momma! I love you! We had the most marvelous wedding because of all of my family and the countless hours that you put into it. And I have the most wonderful groom because of what you all have poured into me to wait for and what Ryan’s family has poured into him to be the man that he is. The Lord has blessed us a ton this year and I’m looking forward to what He has in store in the coming years! And thanks, Storm! We loved having you be such an intimate part of the beginning of our relationship and the same even now when you and Saber come to hang with us for a day or two. Seriously…it feels natural and effortless to have you around. Love you a ton!